Are Portlandia's best days behind it? I realize that even setting a toe in that water puts me in danger of embodying one of the biggest Portlandia clichés, but it's a sincere question. A quick search on Youtube reveals that the most-watched clips from season two can't even touch "Put A Bird On It," "Is It Local?" or "Have You Read?" Now, I know how time works, and those clips have had more opportunity to make the rounds, but it's clear that "Battlestar Galactica" and the very Bird On It-like "We Can Pickle That" and "Sanitation Twins" are the closest season two comes to viral hits. As much as I enjoy Portlandia, I would be thrilled if hipster jokes finally, finally made their exit, and we were all spared the the hipster grandma Tumblrs, and the "you know you're a hipster if" quizzes, and the thing where putting glasses on an animal makes it a hipster. If the decline of hipster jokes means an inevitable decline in Portlandia's fortunes, well, I can live with that. But maybe I'm foreseeing doom simply because these characters are starting to irk me. Sure, there's a lot to be said for the Springfieldification of the show, but the feminist bookstore owners—and now mayor Kyle MacLachlan—no longer herald hilarity for me. "No Olympics" nicely encapsulates Carrie Brownstein's description of Portland as a "City with a lot of self-esteem, filled with people with a lot of self-doubt." Carrie and Fred start the episode looking down their noses at Olympic athletes, "running around with their big muscles," but after a hot tub heart-to-heart with Greg Louganis, they change their minds and decide Portland isn't too good for an Olympic village after all. As chiseled, affable Louganis tells it, The Olympics are like "the punkers of sports." Sure. And just like that, the cool nerds and the cool jocks mend fences, and our heroes bike, run, and swim (eh) their ways into some triathlon tinsel. Brownstein is especially good during the meeting with the mayor. She's ready, as ever, with the rock angle (The Clash's "London Calling" was used, bizarrely, to promote the 2012 Olympics), while Armisen makes with the funny voices, which is more or less his role this episode. And in a quietly tragic moment, the Mayor's attempts to offload a bunch of generic PDX caps are stymied by the anti-cap couple. With the season's weakest cold open, the joke-light plot, and that disturbing interpretive canoe dance set to Erasure's "Oh L'Amour," "No Olympics" leads with its worst bits. 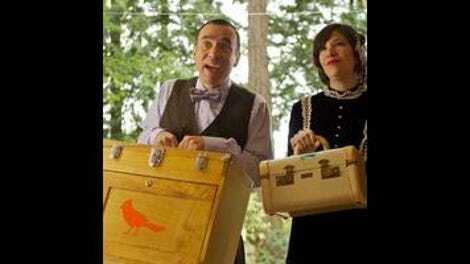 For me, an episode of Portlandia can have weak sketches and still succeed overall. It's only when the lackluster material clumps together that an episode really drags. Some relief arrives, finally, in the form of "Lipsy Park," which sees Armisen and Brownstein as landscape designers tasked with immortalizing a pillar of the community in park form. As his grieving widow looks on, the duo give the most perfunctory of nods to the greenery before getting into the psyches of the kite flyers and joggers that litter the model. Judging by the audience's reaction, Armisen and Brownstein may be completely missing the point of their own jobs, but everyone's pleased as punch. So which works better? When the audience is part of the absurdity, or when it plays the baffled straight man? We get the second scenario two scenes later when Meriwether Lewis and William Clark school a bunch of youngsters on the Corps of Discovery Expedition at the Oregon Historical Society. No one's playing Sacajawea, but no matter, the kids can just imagine she's there, right? Or they might be able to if Lewis and Clark didn't insist on interpreting her "silence" as a snub. This silliest of silly premises actually works, even if it's mostly an excuse for Armisen and Brownstein to yell into the aether and get huffy. Famed guitarist for The Cribs (and others) Johnny Marr appears in the penultimate sketch to fulfill the episode's guest star-quota, and Armisen and Carrie portray another pair of working incompetents. The real reason for sticking around until the end of "No Olympics" though is Kyle MacLachlan's impassioned, improvised (I assume) performance from atop a giant red cushion. "All the birds and the crickets and the frogs, they chant her name.. Portland!" He states/sings. It's a high point for MacLachlan's character, and another opportunity for the episode to deliver more of those awkward audience reaction shots. At least "No Olympics" finishes strong. So, get excited, those of you who can't get enough of Candace, Toni, Kath, Dave, and all the rest of the recurring characters. The finale is absolutely lousy with them.